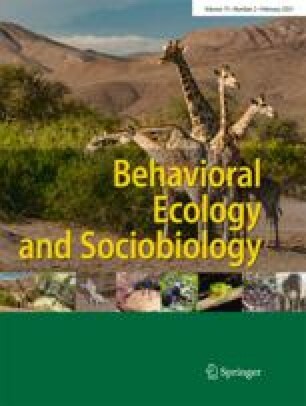 The concept of a suite of foraging behaviors was introduced as a set of traits showing associative directional change as a characterization of adaptive evolution. I report how naturally selected differential sucrose response thresholds directionally affected a suite of honey bee foraging behaviors. Africanized and European honey bees were tested for their proboscis extension response thresholds to ascending sucrose concentrations, reared in common European colonies and, captured returning from their earliest observed foraging flight. Race constrained sucrose response threshold such that Africanized bees had significantly lower sucrose response thresholds. A Cox proportional hazards regression model of honey bee race and sucrose response threshold indicated that Africanized bees were 29% (P<0.01) more at risk to forage over the 30-day experimental period. Sucrose response threshold organized age of first foraging such that each unit decrease in sucrose response threshold increased risk to forage by 14.3% (P<0.0001). Africanized bees were more likely to return as pollen and water foragers than European foragers. Africanized foragers returned with nectar that was significantly less concentrated than European foragers. A comparative analysis of artificial and naturally selected populations with differential sucrose response thresholds and the common suite of directional change in foraging behaviors is discussed. A suite of foraging behaviors changed with a change in sucrose response threshold that appeared as a product of functional ecological adaptation. Thanks are extended to W.L. Rubink for supplying Africanized queens, and two anonymous reviewers for constructive criticism that improved this manuscript. This project was supported by funds from the Texas Honey Bee Initiative and USDA 58-6204-8-093. Bees were handled in compliance with current laws of the United States of America.